Owing to the skilled, experienced, competent and hard working workforce, we have been able to attain remarkable success in this domain. Our company has hired different professionals after analyzing their technical and professionals skills on various predefined parameters. Based on their expertise and experience, these professionals are grouped into specialized units. We believe in providing our employees with regular training sessions that help in updating their skills in the most efficient manner. To ensure stream-line operations, we have divided our infrastructure into various departments. Our manufacturing unit comprises of advanced machinery such as lathe machine, mechanical press, hydraulic press, bending machines, cutting machines and welding machines. The machines installed in our manufacturing unit are capable of meeting bulk demands in a stipulated time frame. These ultra-modernized machines are upgraded regularly that help us in meeting with the requirements of changing market trends. Amarshiva is a professional grinder mill and stone crusher manufacturer, exporter, wholesaler and supplier. Since the day Amarshiva is founded, it is already several decades. During this long developing road, our company devoted ourselves into hardworking search and develop grinder mill and stone crusher. Now our company has become one of famous grinder mill and stone crusher manufacturers in India. 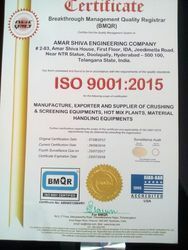 Now, Amarshiva extended our services into South Africa and hope to be a great South Africa crusher supplier. We forge our quality with care and elaboration, mold our resplendence with sincere and persistence. We in pursuit of being envoy of honesty, will progress with the world in harmony and sparkle the light of civilization all the way. In pursuit of sustainable progress and harmonious partnership with the world, Amarshiva has successfully strived to develop a kind of culture with unique tone, enriched color and dynamic spirit. We have gained reasonable success in a short span of time by providing them high quality industrial crusher and material handling machines at affordable market prices within stipulated time frame. Our product range is highly appreciated among our customers for their optimum performance, resistance to corrosion, minimum maintenance, impeccable finish and long functional life. Due to our vast and well connected distribution network, we export our product range to South Africa as well.